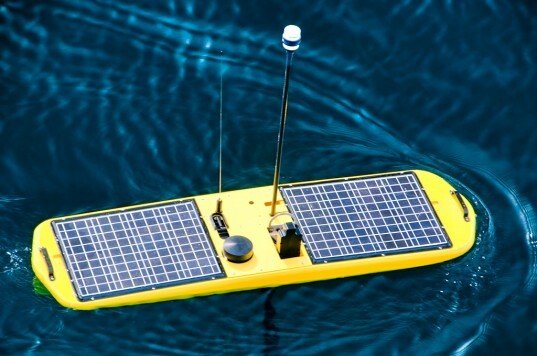 The Wave Glider—a self-propelled, solar and wave-powered robot designed by Liquid Robotics—has been deployed to track great white sharks in the Pacific Ocean. Stanford University scientists are hoping to understand why the great white shark population in an area near the Californian coast has been in decline over recent years. Last year, we reported how The Wave Glider had been awarded $22 million in Series D financing in order to serve as a platform for ocean observation, data collection, intelligence, surveillance and reconnaissance. The Stanford team said that The Wave Glider will join “an arsenal of ocean-observing technologies” that will spy on the marine predators in real-time. The Wave Glider’s mission will see it collect and send data from any acoustic-tagged animals that pass within 1,000 feet of it. These signals are then sent to an onshore research team led by Stanford marine biologist Barbara Block, who aims to create a “wired ocean”. “Our goal is to use revolutionary technology that increases our capacity to observe our oceans and census populations, improve fisheries management models, and monitor animal responses to climate change,” Block said in a statement. The area that the Wave Glider will operate in is located just off the Californian coast, and is a densely biodiverse region known as the “Blue Serengeti”. It is teeming with blue whales, bluefin tuna, white sharks, mako sharks, sea turtles, elephant seals and other sea life. However the area has seen the number of great white sharks fall, so that’s why Wave Glider is being deployed. Using a new iOS app called “Shark Net”, anyone with an iPhone or iPad will be able to track the Blue Serengeti’s inhabitants in real time. The Wave Glider—a self-propelled, solar and wave-powered robot designed by Liquid Robotics—has been deployed to track great white sharks in the Pacific Ocean. Stanford University scientists are hoping to understand why the great white shark population in an area near the Californian coast has been in decline over recent years. Last year, we reported how The Wave Glider had been awarded $22 million in Series D financing in order to serve as a platform for ocean observation, data collection, intelligence, surveillance and reconnaissance. The Stanford team said that The Wave Glider will join "an arsenal of ocean-observing technologies" that will spy on the marine predators in real-time.